It wasn't all lessons-learned today. A whole fleet of dolphins surrounded the boat this afternoon, and then accompanied us for a few minutes before speeding off to do whatever dolphins do. They do always seem to be doing something and going somewhere, don't they? Wonderful when they stop long enough to say hello. Oh, the seduction of making 7 easy knots. North! Towards deliciously cooler weather. For free! Who could resist? Not me, but as I should know by now, there’s a price to pay for everything. As we raced north last night, tracking our course-made-good on my iPad, I realized that while we were headed practically due north, the coast of Florida was slanting off to the north west. Gradually, ever so slowly, we were getting further and further from the coast. By the time we passed Stuart, I lost my cell phone signal. 12 miles out. Not so bad. I would have preferred to stay within cell phone coverage distance, but as we were sailing dead down wind (again) on the starboard tack, we would have to gybe to head more west. It is not so easy to gybe with a wind vane steering the boat, so I put it off and put it off, hoping the wind would shift to the south east. It never did, so well after dark, I finally stirred myself and gybed over to the port tack. This allowed me to steer more to the west, and I figured we would gradually close with the coast. But I didn't count on the strength of the mighty Gulf Stream. This pushed us north faster than we were moving west, and the coast also slanted away, so by the time we were passing Cape Canaveral at dawn this morning, we were 46 miles off shore. Clearly it was time to get more serious about this going-west thing, but the wind - all 6 knots of it, had turned to the northwest, limiting our options. Reluctantly, I set a course to the southwest, hoping to cancel out the effect of the Gulf Stream. It did, but our speed over ground dropped down to 3 knots as we bucked the mighty current. At that rate, it would take all day to reach the coast. Here was the bill for our easy progress north. 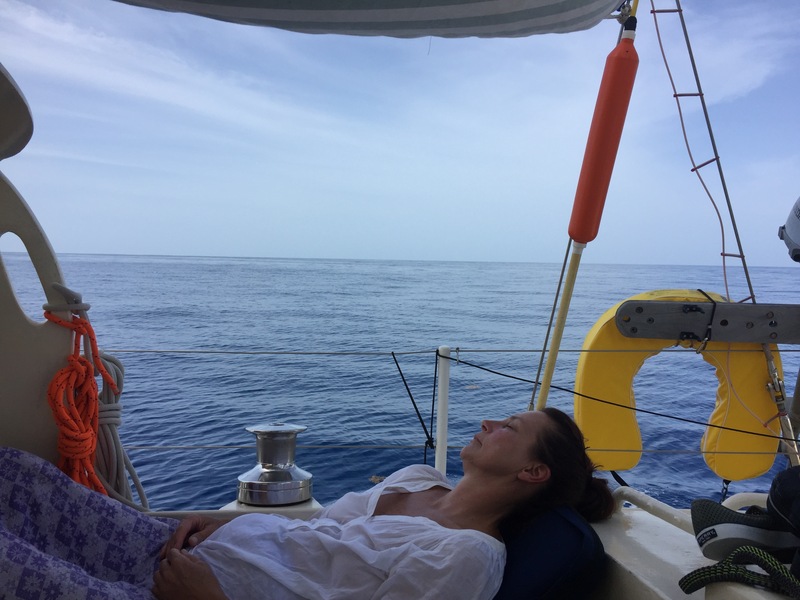 Helena took over the watch and I went below for a couple hours sleep, still hoping for that wind shift. By lunchtime, the wind away faded altogether, just to put a fine point on the lesson. We are now motoring over a calm sea, towards the northwest. At 5 knots, it will take 8 hours to close with the coast. I'm still hoping for that wind shift, but the lesson has been learned. There’s no such thing as a free ride on the Gulf Stream. Wonderful! Living the life, Helena! Do you need any future mates? I'm enjoying your stories. What is your next port? Any plans to hit Long Island? We are heading north, but how far and how fast is up to the wind, now. We are at Jekyll Island at the moment. Next we are aiming for Southport, NC.